Airtel Payment Bank – India’s First Ever Payment Bank launched today across 29 states in India. Finance Minister Arun Jaitley, formally launched the bank. As an introductory offer Airtel Payment Bank Customers will get a Interest Rate of 7.25%, the highest in India. Free personal accident insurance cover of Rs 1 lakh would come with every account opened. All the 250,000 Airtel retail stores that that will function as banking points around the country for easy deposit and withdrawal of money. Airtel is not offering any Debit card/Cheque – if you want to withdraw cash, you will need to go to your nearest Airtel retail store. Over 10 lakh customers were added during the pilot phase in Rajasthan during Nov 2016. Airtel Payments Bank plans to develop a nationwide merchant ecosystem which will include small kirana stores, small shops & restaurants etc. These merchant partners will accept digital payments for goods and services from Airtel Payments Bank customers over mobile phones. To Promote Cashless transactions payment bank will not charge any processing fee from merchants and this facility would be totally free for the customers as well as the merchants. How Airtel Payment Bank Makes Money? Payment Banks are barred from any kind of lending activity, which means that the only way to generate returns is through cross-selling products through the payments bank network. Payments banks, as defined by the RBI, are entities that will primarily facilitate digital transactions. These entities can accept deposits, capped at Rs 1 lakh. These funds must largely be invested in government securities. Airtel Payment Bank makes money while the customer does cash withdrawal or tranferring to non Airtel Payments Banks. See the following list of charges. 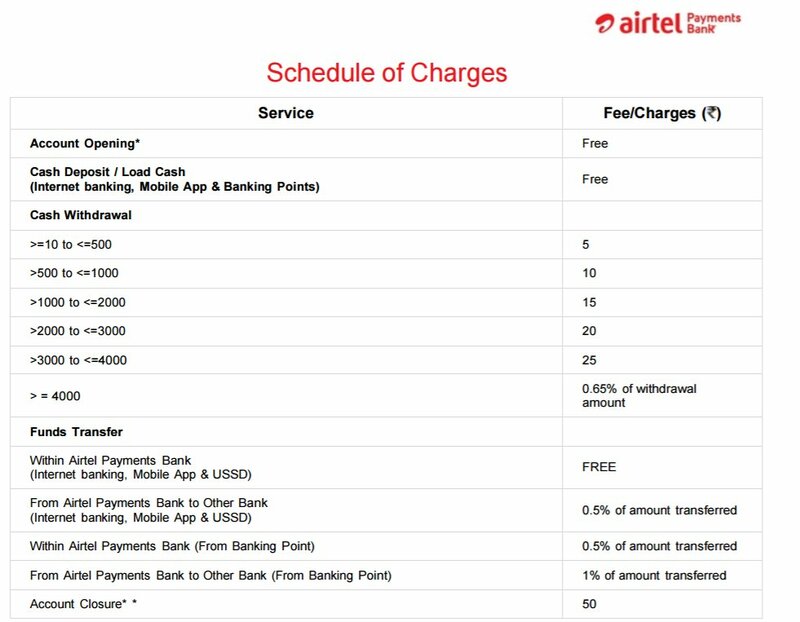 How Airtel Payments Bank is different from the Airtel Money wallet? Airtel Payment Bank is not just a digital wallet. Despite that it will also allow their customers to transfer money across bank like any other traditional banks and also pays interest for the money parked in the payment bank. Whereas parking money with Airtel Money wallet will not earn interest on deposits. Customers of Airtel Money will be given provision to transferring their current balance from the wallet into their Airtel payments bank accounts. I,K.Nagaraja,opened Airtel Payment Bank A/C 9440396488 and deposited Rs 10000/-.Airtel failed to give me free minutes in spite of their offer to give free mts- 1 for every rupee deposited initially.Sheer violation of their own offer! Their action gives me a doubt about their assurance of 7.25% interest. !